Few days back i wrote about Kaspersky 2010 products. Norton 2010 range of products are still in beta stage now. The beta is open to public and anyone can test it on their system if they feel like. * Scans only files and processes at risk using Norton Insight. * Installs in under one minute on average, requires less than 8 MB of memory. * Delivers up-to-the-minute protection with rapid pulse updates every 5 to 15 minutes. * Provides multi layered security through the Norton Protection System. * Defends against Web-based attacks. * Recovery tool boots and repairs badly infected PCs. Delivers our most complete, deep cleaning scan possible. I downloaded it and installed on system. Visually i didnt see any major changes. It looked like same as 2009 version but few additions and deletions along with some minor enhancement menus. The setup file downloaded isn’t a full installer. The setup file downloads all the files needed for installation through internet. After installation, one of the changes i saw is, the memory it took for running. It looks a bit better compared to 2009 and took less memory for running. The settings options page was simpler but for me it looked complicated as a advance userÂ who wants to configure each setting. Another addition is Norton insights which gives ratings to applications based on the symantec server databaserunning on your system.It improves false detection rates. Overall, it looks too simple to use. It will make a novice user feel great as there is almost nothing to configure but for me,Â for the same reason looked bad as i cant see whats configured and how. The reason being i need to set so many network options for some of the softwares i use. 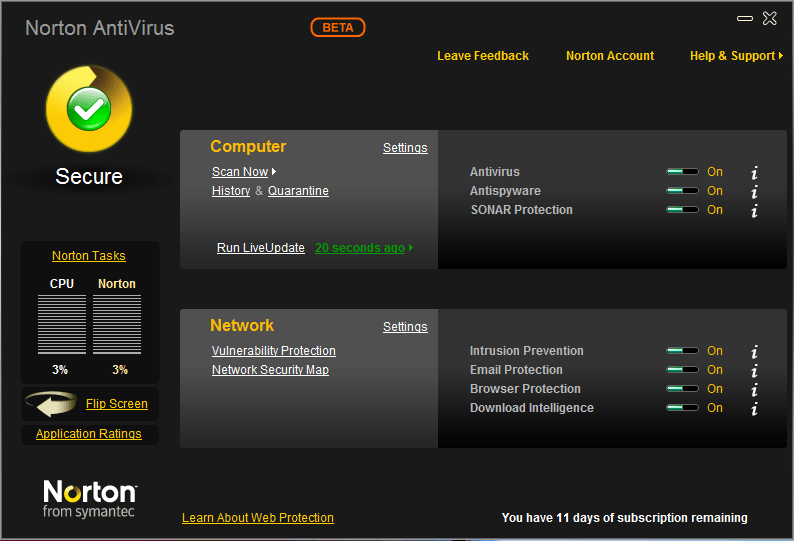 The beta version of Norton AntiVirus 2010 is now available for Download and activation key for 15 days can be found at the link below.